Ce document au format PDF 1.6 a été généré par Bluebeam Revu x64 / Bibliothèque Bluebeam PDF 2015.1.1, et a été envoyé sur fichier-pdf.fr le 20/09/2016 à 17:21, depuis l'adresse IP 24.37.x.x. La présente page de téléchargement du fichier a été vue 274 fois. Taille du document: 920 Ko (39 pages). website takes priority over any other source except as noted herein. reading of teams participating to both American and Canadian competitions. innovate, practise professionalism, and use structural steel efficiently. are encouraged to maximize their involvement in fabrication. with and competing against teams from other colleges and universities. realistic challenges encountered in bridge design and construction. categories are architectural design, structural efficiency and constructability. authority to accept and reject entries. compare alternatives prior to fabrication using value analysis based on scoring criteria. design of the bridge will be evaluated. run parallel to the river. but the foundation at one end would conflict with the existing water and sewer pipes. charge. Both alternatives, simple span and cantilever, have the same overall length. strength to weight ratio, and high levels of recycled content. whose model satisfies specified requirements and best achieves project objectives. the model and terminating the company’s eligibility. for load testing in subsection 11.2.
a brief description of the problem on the data form. precautions listed in subsection 11.2 guide safe load testing prior to competition. worksheet from the scoring spreadsheet may be given to the captain if requested. score as described in Section 6.3.
fabricated professionally rather than by students. lacks appropriate identification will receive a very low architectural design rating. fabricate the bridge or provided advice. be in English or French. an optional second poster that could accommodate their logos. must be in place whenever the bridge is on display. An oral presentation (maximum 5 minutes) is required for each participating university. presentation. Judges will be allowed time to ask questions after the presentation. restraint devices, and posters are not included in total weight. The bridge with the lowest aggregate deflection will win in the stiffness category. Aggregate deflection is determined from measurements as prescribed in 11.5. + $150,000 if A &amp; C footings are used. cost of the bridge (OC). The AD portion is worth one third of the overall scoring (33.3%). 1st to nth place (with n being equal to the number of teams competing) for each category. score for the entry. Raw scores will be used in the event of a tiebreaker. determine the overall ranking (OR) in a given category. on the overall score (OS). The team with the highest overall score wins the competition. test load, practice construction, and select the builders for timed construction. (1) The committee determines the order in which teams will compete. way except for corrections prescribed by subsection 9.4.
may observe the roll. The same locations will be used for all bridges. used for all bridges in the same conference competition. Component Specifications,” and subsections 10.1, 10.2 and 10.6 for details. (7) Timed construction. See section 10, “Construction Regulations,” for details. leaning or sitting on the bridge is not allowed. those that are withdrawn from competition and not ranked for awards. (10) Load testing. See section 11, “Load Test Instructions,” for details. given to the team captain electronically or on paper. (12) Scores and rankings are determined using the official scoring spreadsheet. (1) Bridges are not modified after selection of loads and sides locations. (2) Bridges are not modified between display judging and timed construction. connection corrections described in subsection 9.4.
coatings and decals are permitted, and bridge parts may be labelled. construction and load testing. Members with moving and flexible parts are prohibited. during construction and load testing are not violations. fit into a right rectangular prism (i.e., box) of those dimensions. threaded part of a member if that part is necessary for compliance with 9.4.1.
modified in any way but may be painted. specifications of subsection 8.2.4 is not a violation. members. See Section 1 on the Bridge Diagrams. 9.2.2 The bridge shall provide access for safely placing 3’-6” wide decking and load. support surfaces that enhance strength or stability of the bridge. 9.2.4 Decking shall not distort the bridge from its as-built condition. 9.2.5 The bridge shall not be anchored or tied to the floor. 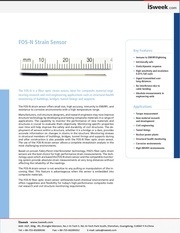 Specifications in this subsection (9.3) are illustrated by the Site and Bridge Diagram. violations of the same specification, the penalty will be based on the largest violation. 9.3.1 The bridge shall not touch the river or the ground outside the declared footings. Refer to 10.1.8 for definition of “declared footings”. 9.3.2 The bridge shall not extend more than 5’-0” above the ground or river. 9.3.3 The bridge shall not be wider than 5’-0” at any location along the span. river or ground at any location along the span. footings A and B or footings A and C are declared. will be in addition to penalties for non-compliance with 9.3.7.
separation not exceeding 1/4” and a change in elevation not exceeding 1/8”. necessary to apply restraint during the lateral load test described in subsection 11.4.
and will be granted the option to correct connections that violate specifications 9.4.3.
threaded part of a member shall pass through holes in all the members that it connects. A loose bolt or threaded part of a member may connect more than two members. Penalty is five minutes added to construction time for each individual violation. 9.4.2 Every individual nut shall fully engage the threads of the matching bolt or member. five minutes added to construction time for each individual violation. of a loose nut on a loose bolt, only one penalty will be applied for that fastening. every individual threaded end, nut, and bolt head that cannot be inspected. 10.1.2 The team designates one builder to serve as “captain” for the entire competition. finish, and signs scoring forms. 10.1.4 The “River” represents a natural feature that builders will not enter. 10.1.6 Builders carry objects across the “transportation zones”. team may choose either the footings marked A and B, or the footings marked A and C.
zones, transportation zones and staging yards, but excluding the river. competing organization provides its own personal protective equipment. builders and having the same function. completed bridge. A competing organization provides its own tools. 10.1.14 “Member”, “loose bolt”, and “loose nut” are defined in subsection 8.2.
zones. There may be multiple constructed portions. 10.2.2 There shall be no more than six builders. not be used during timed construction. concentric axes so that dimensions of the temporary piers are not changed. 10.2.5 Containers of lubricant shall not be in the construction site at any time. safe procedures. Builders will have the opportunity to construct their bridge safely. be eligible for any awards in the structural efficiency and constructability categories. personal injury. Only builders and judges may be in the construction site. equipment in the proper manner. or held in a builder’s hand(s). 10.3.4 Nuts, bolts, and tools shall not be held in the mouths of builders. 10.3.5 Throwing anything is prohibited. with tools) more than one member that is not in a constructed portion. temporary pier and touch (or touch with tools) a constructed portion or a member. 10.3.9 A temporary pier shall not be moved while it is supporting a constructed portion. floor, or standing with the heels and toes of one or both feet on the floor. be a member, loose nut or loose bolt while in contact with that constructed portion. of the provisions of this subsection (10.4). bolts will be returned to the positions they occupied before the accident. a member, tool, nut, bolt, or personal protective equipment. the site boundary. Penalty is 1/4 minute (15 seconds) for every occurrence. is 1/4 minute (15 seconds) for every occurrence. touches or is in contact with another member that is not part of a constructed portion. Penalty is 1/4 minute (15 seconds) for every occurrence. 10.4.6 A temporary pier falls over or collapses while supporting a constructed portion. Penalty is 1/2 minute (30 seconds) for every occurrence. tapes, not the centrelines, designate the lines shown on the drawing. and B footings, or on the four A and C footings. construction begins. Similarly, temporary piers may be passed from builder to builder. There shall be nothing within the construction site that is not in a staging yard. construction site after the beginning of timed construction. and the judge declares the start. (4) if a builder or judge is injured. positions they occupied before the interruption, and the clock is restarted. inform them when it is reached. (5) the captain informs the judge that construction is complete. 10.9.2 Installation of decking is not included in timed construction. 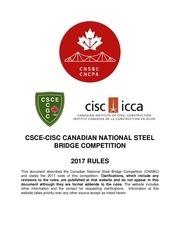 connections as prescribed in subsection 9.4.
construction except as prescribed by subsection 9.4.
follow the same precautions when proof testing bridges in preparation for competition. eligible for any awards in the structural efficiency and constructability categories. wearing the specified safety equipment or are wearing it improperly. 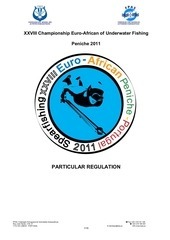 11.2.2.1 Not more than three competitors shall participate in lateral load tests. to prevent personal injury if a bridge collapses. adequate strength, height, and numbers to arrest falling load if a bridge collapses. sufficient to arrest the load even if only one side or one end of the bridge collapses. under bridge trusses or cross braces, if possible. material provided by the host student organization. replaced as it was before being removed. exceeds 1”, loading shall crease and load shall be removed carefully. exceeds 3”, loading shall cease and load shall be removed carefully. the load shall be removed carefully if, in the opinion of a judge, collapse is imminent. handle load shall comply with 11.2.1.3 but does not count toward the three-person limit. 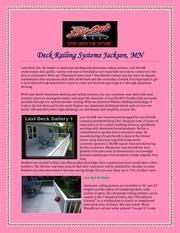 conditions such as bent decking, sloping floors, and unfavourable floor surfaces. exceed the specified limit, even if the plumb bob is not attached to that part. applied. No additional uplift restraint will be used, even if bearing surfaces lift. Bearing surfaces are prevented from sliding by lateral restraint applied by competitors. to the floor as possible, at the locations shown on the Lateral Loading Plans. is not applied close to the ground, or if the restraint is not effective. location of the corresponding lateral load. appropriate box on the judges’ scoring form. If the bridge passes both lateral load tests, proceed with vertical load tests. failed if sway exceeds 1/2&quot;. A fifty-pound lateral pull is applied and sway is measured on the left side of the bridge. shifted laterally to a feasible location between the ends of the decking support surfaces. The test is failed if sway exceeds 1/2&quot;. The provisions of this section are illustrated by the Vertical Loading Plans. shall not be attached to the bridge and shall not distort it (see 9.2.3 and 9.2.4). beginning of the competition as described by paragraph 7.1.
the C end of the bridge. in contact with the decking support surface. drop more than approximately 5” if the bridge collapses. DbL centred on the left side of the decking unit closest to the A end of the bridge. DcL on the left side and 1’-0’’ from the C end of the bridge. construction as described by paragraph 7.1.
shall stand outside the bridge while placing load. testing. Check the appropriate box on the judge’s scoring form. spreadsheet to compute absolute values of deflections at DbL and DbR. scoring spreadsheet to compute absolute values of deflection at DcL. $10,000,000 to the Structural Efficiency score. (1) Initialize the sway measurement device. (3) Competitors place the Wb load. by both the team captain and a judge. (1) Load Wb remains in place. devices at DbL and DbR. initial reading must be recorded by both the team captain and a judge. (4) Competitors place the Wc load. team captain and a judge. (not including load test penalties) for the initial run. perpendicular to the length of the bridge, creating a roadway that is 3'-6” wide. of the bridge but not for the edges that are perpendicular to the length. buckets, timbers, sand bags, or masonry units. lengths of 5” x 5” x 5/16” steel angle placed perpendicularly to the length of the bridge. in from each end of the decking locations. avoid misinterpretation of rules at the competition. All RFIs will be made public. will be available on a website, which will be available later this fall. committee will identify the head judge. hear the appeal if he or she is approached by students other than the team captain. during the competition and particularly concerning appeals. 15.5 The decision of the CNSBC rules committee is final; there are no further appeals. Ce fichier a été mis en ligne par un utilisateur du site. Identifiant unique du document: 00452636.